Counseling Addicted Families, 2nd edition is an up-to-date treatment manual that fosters lasting change for families dealing with addiction and addictive disorders. 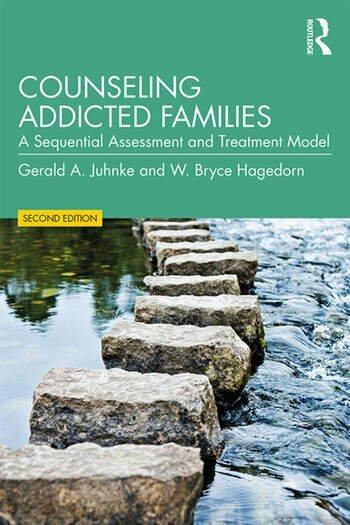 Focused around the clinically esteemed Sequential Family Addictions Model, the book guides counselors through the principles of how to ‘progressively sequence’ a client family during their change process, and explores how family counseling theories and interventions can be applied in treatment settings. This revised second edition aligns with the DSM-5 Substance Use Disorder criteria and terminology and includes new sections on neuroscience and cutting-edge drug detection assessment methods. Both experienced and entry-level counselors will appreciate how the Model improves their clinical skills and knowledge to address the idiosyncratic needs of each individual family system and create healthy systemic change. Gerald A. Juhnke, Ed.D., is a licensed professional counselor and was the founding director of the Counseling Doctoral Program at The University of Texas, San Antonio. He is a past president of the International Association of Addictions and Offender Counselors, past Editor-In-Chief of the Journal of Addictions & Offender Counseling, and is a fellow of the American Counseling Association. W. Bryce Hagedorn, Ph.D., is a fellow of the American Counseling Association and currently serves as a professor and program director of counselor education at the University of Central Florida. In addition to his work at the university, he is a licensed mental health counselor and a clinical supervisor for the state of Florida. "This book is an essential resource for counselors and other helping professionals who work with clients addressing issues related to substance abuse and addiction. The current revision provides the most up-to-date information regarding diagnosis and intervention strategies. Highly recommended!" "This important second edition contains valuable evidence-based tools that counselors and addiction specialists will find extremely helpful in any clinical setting. Counselors have long known the major significance of caring for the whole family and this new edition addresses important needs with practical family interventions and key counseling tools that guide families toward achieving recovery. Juhnke and Hagedorn provide our field with answers to the myriad challenges of successfully treating the devastating family health complications arising from addiction."